In November 2013, I picked up a copy of the book Postwar Air Weapons, which had lots of interesting history and ideas for scale projects. 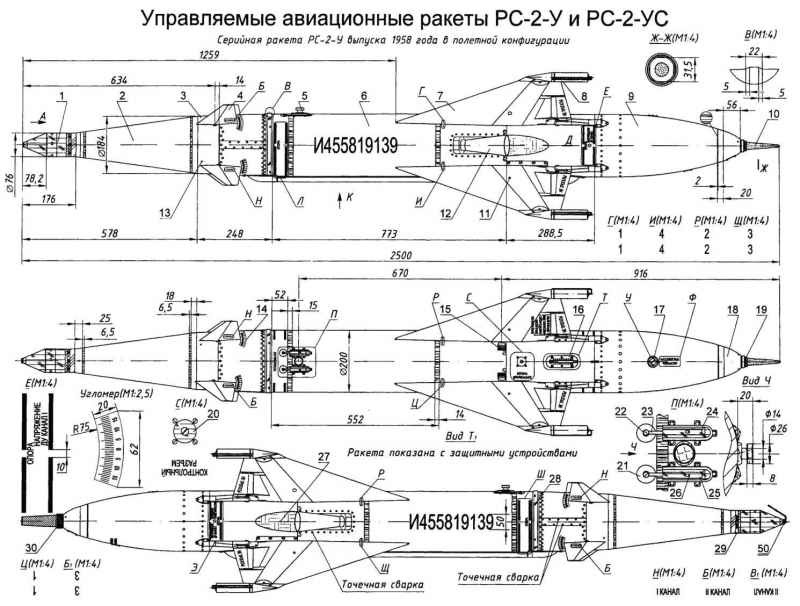 Soviet prototypes are always interesting looking, but the RS-2U / PC-2У air-to-air missile jumped out. And so, I just had to build my own. 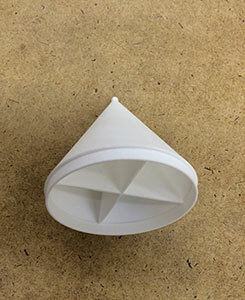 At just over 8' in length and just under 8" in diameter, this was the perfect prototype for a full-scale model. The first thing to do was find drawings, which was hard to do. Simple Google searches turned up some pictures of MiG-19s and a few images of the RS-2U / K-5 missile, but not much detail. 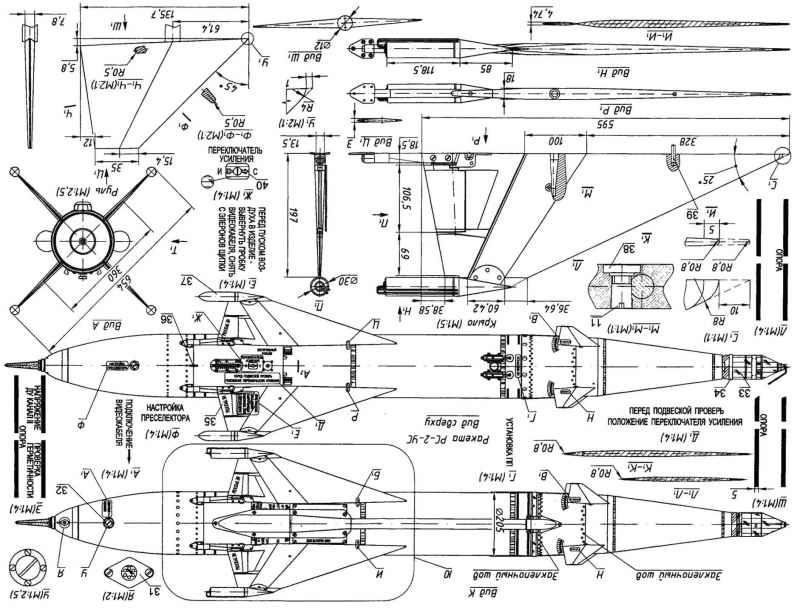 The drawing above, from the Military Russia blog, is a decent line drawing, good enough for a sport-scale model. It's also good because it has two views 90° apart, showing the motor and non-motor sides. At any rate, I was able to produce this overall drawing by tracing over a nice rendering, and checking the dimensions against the line drawings. The nose would have a 3" airframe tube in the center of it, to house the electronics, but otherwise would just be cosmetic. 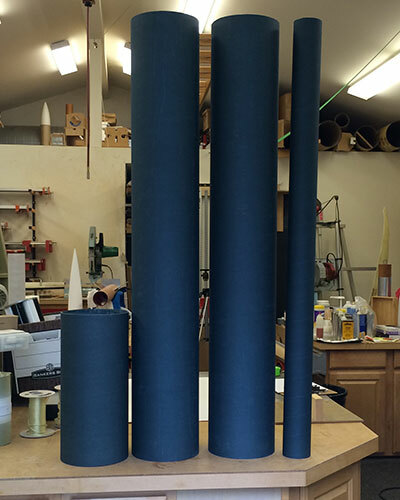 Since the tail would be removable for flight, this leaves a reasonably standard rocket shape. No room is left for dual deployment, but this isn't really an altitude rocket anyway. This sat on the drawing board until October 2015 when I decided to start working on it. 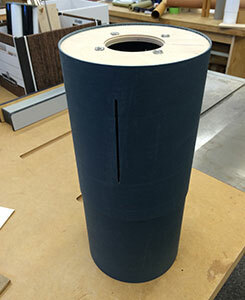 I'd just posted a page on Body Tube materials and that inspired me to try Blue Tube 2.0. 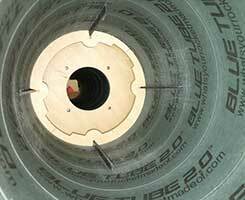 Above you can see the coupler, two 7.5" tubes for the main airframe and the 3.0" tube for the forward section. 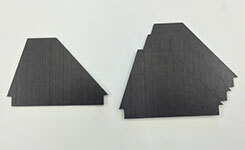 They look really solid, without being brittle, so I'm excited to try out this material. 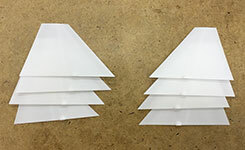 Fins, centering rings and bulkheads were cut by me using a CNC router. I started working on the forward section (everything forward of the main section). This section also includes the electronics bay and has a set of canard fins. 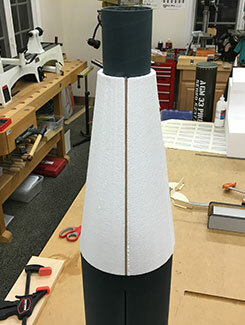 There is a large conical transition from the 7.5" main airframe to the 3" tip section. At first I'd planned to 3D print this profile as well, but that would have been unreasonably expensive for such a large surface. 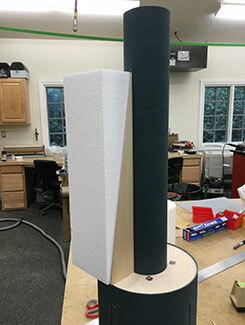 Instead, I went back to an old technique: using EPS foam with a fiberglass skin. And I published a how-to video showing this process. Above you can see how the forward section fits together, with the ribs and foam blocks on the left and the excess foam hot-wire cut away on the right. 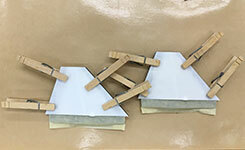 After the bulk of the foam was cut away, the rest was sanded down to match the ribs. Check out the video for more details. 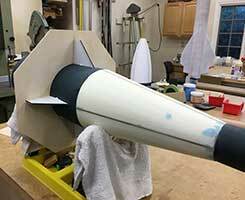 Once the transition was skinned, the canard fins could be installed. These are through-the-wall, although only by about a half inch, but enough for a good inside fillet. Above you can see the canard fins from the outside on the left, and from the inside on the right. There's an extra ring inside with slots for the canard fin tabs, and it still leaves a huge amount of space in this electronics bay! 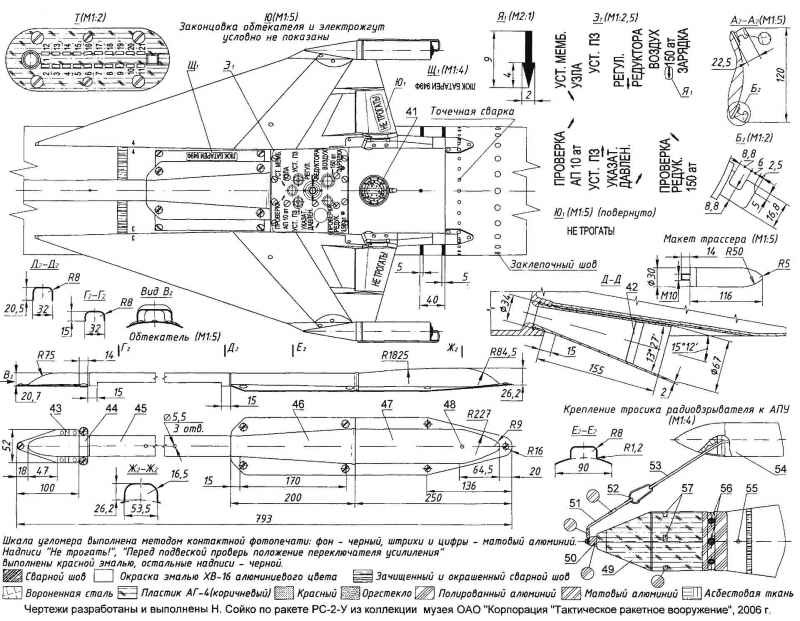 In its improved RS-2U guise, the 'Aklaki' was optimized for use by the MiG-19PM all-weather interceptor. 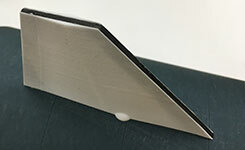 The weapon illustrated has the optional tracers fitted on the fin tips to enable guidance. The aerial at the rear received the radar signals. 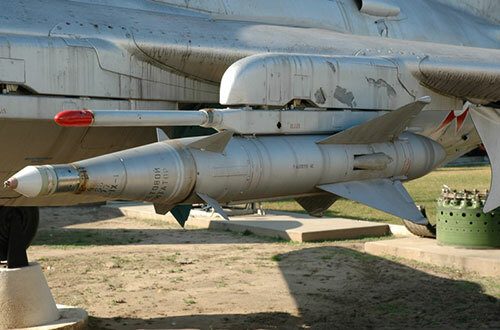 The first Soviet air-to-air missile to enter production and services was the K-5 (which received the NATO/Air Standardization Coordinating Committee reporting name AA-1 'Alkali'). 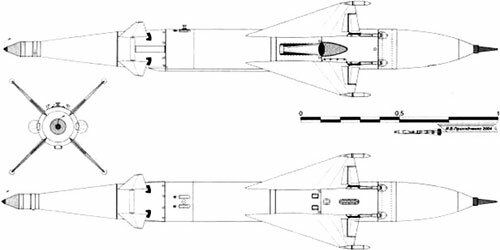 Development of the K-5, which received the missile service designation RS-1U, was sanctioned in 1953 and the missile was tailored for tail-chase engagements against enemy bombers. Incorporating radio command guidance, the RS-1U armed the MiG17PFU, the MiG-19PM and Yak-25K interceptors and was followed by the RS-2U with improved performance, for use on the MiG-19PM. The ultimate derivative was the RS-2US that was optimized for carriage by supersonice interceptors and armed the MiG-19PM, MiG-21 and Su-9.